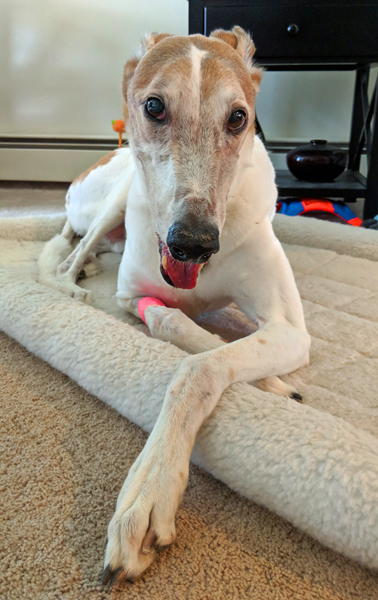 Yesterday, Dudley had to have dental surgery, during which he had 19 (!!!) teeth removed. Greyhounds have infamously terrible teeth, because of their narrow jaws (also seen in other breeds like dachshunds), which is often exacerbated by their terrible diet and zero oral healthcare for however long they had to spend living at the track. That Dudley walked out of there with still half his teeth in his mouth at age 11 is unusually lucky for a grey! (Dogs have 42 teeth, and he had two removed a few years ago.) Zelda, by comparison, still has an entire mouthful of perfect, pearly white teeth. 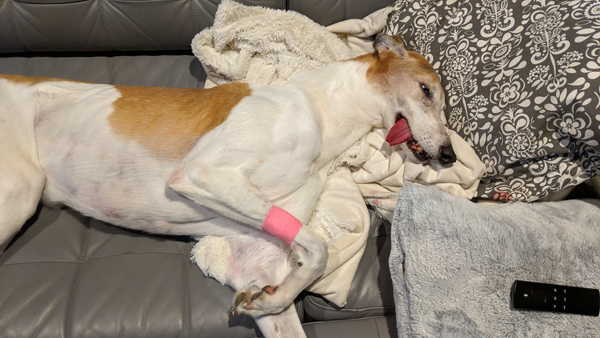 He was still very groggy when he got home, as greyhounds don't have much fat to help them metabolize anesthesia. 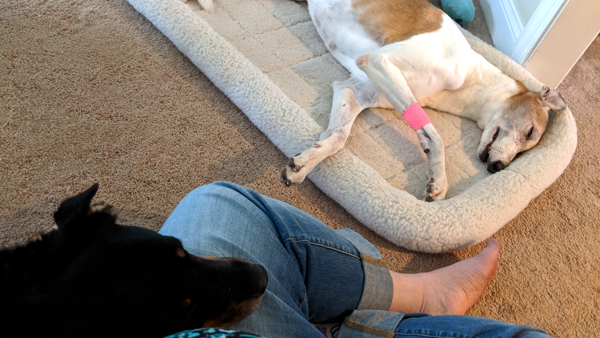 I kept a close eye on him throughout the evening, and of course Nurse Zelly was very helpful with the watchfulness. Dudley got through the night just fine. (I can't say the same for the bloodied pillows and blankets on which he slept, lol!) He's on his pain meds and antibiotics, which he took like a champ. And now he's back to his usual goofy self, although he's very annoyed with me that he's not allowed ALL HIS FAVORITE CRUNCHY FOOD AND TREATS NOW NOW NOW. Not for 10 days. What this means, of course, for all the rest of us is that we're gonna have a lot more grody beef tongue in our future.